This isn’t going to be one coherent article. There are too many things to say and I have too many observations to try and make it one flowing story. Instead, I’m just going to try and break everything up in small chunks of thoughts. I don’t have a lot of photos from PNG either, because while I was there I was either on a boat, underwater, or it was raining. I feel bad about how I approached going to PNG. There is so much bad press given to the country that I think it influenced my plans for visiting. The Top 10 Hells on Earth list that came out is, in hindsight, pretty absurd. Anything which puts Oklahoma City as worse than Baghdad or Chernobyl should be rejected at face. Port Moresby is a dump, there is no doubt about that. But Port Moresby isn’t a reflection of PNG anymore than Detroit is a reflection of the Upper Peninsula of Michigan. I spoke with several ex-pats who have been living in PNG for decades about the bad press which Port Moresby has gotten and some of the things I’ve read. They all thought it was silly. You should be alert when visiting Port Moresby, but you don’t have to be under armed guard at all times. Everyone I met was very nice, even when they had to cancel a flight I had leaving Kimbe. Hotel rooms in Port Moresby are expensive. Very expensive for what you get. You can expect to pay over $200 a night for a simple hotel room. Rooms in the city are booked full almost every night. The high commodity prices right now have spurred a boom in commodity prices. My flights in and out were packed mostly with Australian and Chinese businessmen. I’ve noticed a big difference between poor countries. Many of the places in the Pacific I’ve see you see lots of idle people. People sitting around doing nothing. I saw lots of idleness in PNG. In places like the Philippines or Indonesia, you can see poverty, but you don’t see as much idleness. People are doing stuff, hustling and trying to get by. Mostly this happens when people move from the country to the city and there is nothing for them to do. There are no jobs and there is no land to farm. This is the reason behind so many of the problems in Port Moresby. Idle hands really are the devils playground. I have been to many places in the Pacific where WWII battles took place: Guadalcanal, Guam, Saipan. However, the history was probably more palpable in New Britain than it was anywhere else. I saw a sunken Japanese Zero while I was diving. Pretty much every airport and landing strip in the country was originally built during the war. I’ve been told it isn’t too hard to find planes and other artifacts out in the forest. The Papua New Guinea campaign looms much larger in Australian history than in US history, even though most of the heavy lifting was done by American troops. I learned quite a bit by listening to some locals tell stories during dinner. The water in Kimbe Bay, where I went diving, was very warm. Not only is the bay naturally warm, but it is in the middle of an El Nino. When I dove, my dive computer showed the water temperature around 30C (about 85F). The only evidence of coral bleaching I’ve seen on my trip was in Kimbe Bay. There wasn’t a lot, but there was some. One of the most spectacular things I’ve seen on my trip so far was a tree on a palm oil plantation on New Britain. The tree was filled with lightening bugs, and all the lightening bugs were blinking in unison. There were so many bugs in the tree that it looked like the kind of trees you see in mall parking lots during Christmas filled with white lights…. except these were blinking. I’m not sure I could have taken a photo of it that did it justice even if I had my camera with me. Just a week after I left New Britian, the volcano near Rabaul erupted. 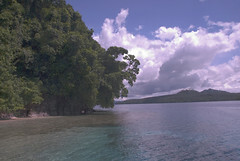 Rabaul was covered with several feet of ash in 1994. The entire city had to be moved. All of Kimbe Bay was ringed with cinder cones. I’ve never seen a place with so many. If you were out on the bay and looked around, you could see a dozen small volcanoes. 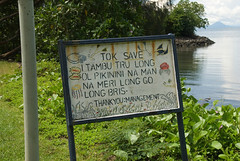 There are over 800 active, living languages in PNG. This is not an exaggeration. I asked the locals I met what languages they spoke, and they all spoke their village language, pidgin, and English. Pidgin is more widespread than English and some remote villages have very few pidgin speakers. Literally, villages just a few miles apart can speak languages intelligible to each other. I met some Americans at the airport who have lived in PNG for 10 years with an organization trying to translate the bible into every language in PNG. Personally, I’d just translate it into pidgin and teach everyone pidgin. Seems a lot simpler. I’ve encountered people who work, worked, or had parents who worked for such organization who try to translate the bible into ever smaller languages. I guess they are trying to complete the set. I very much want to go back to PNG. Almost every place I’ve been I have a list of things I’d go see if I ever returned. I think the list for PNG is the biggest one I have. I very much would like to go back to see the highlands, which is a culture which seems very different from what I saw on New Britain. If anyone in the future who is thinking of visiting PNG should read this article, don’t be afraid. Avoid Port Moresby, but there isn’t anything to see or do there anyhow. I just came back from PNG. I love every minute of it, the people where so nice to me. I know it can be dangerous but I never felt threatened once. Interesting post and comments! Ive always been fascinated with PNG, not sure why exactly. Maybe because of its intriguing name. Maybe because it used to be a German colony (Kaiser-Wilhelms-Land) and as a native German Im interested in that. Did you actually go to the nothern parts Gary? Did Papuans have any particular opinion about Germans? If I ever go to visit I will explore that aspect and also check out the rainforest. As for pidgin, isn’t that also spoken in Hawaii? Hawaii does not speak Pidgin. English and Hawaiian. 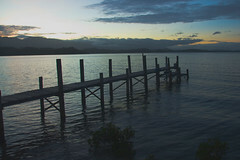 It sounds like you had a wonderful childhood growing up in PNG, and what you describe makes me more determined to visit. I agree that you cannot judge a third world country in the same terms as an industrialised nation. Thought I’d contribute something in response to your assessment of PNG; I’m a Papua New Guinean national who has lived in Oz for 21 years having married an Aussie and have subsequently raised and continue to raise a wonderful family in Sydney and love it here. By the way, even though my husband is an Aussie of Anglo/Saxon background, he considers himself a Papua New Guinean as he grew up in PNG, went to school in PNG and graduated from the University of PNG. The point I’d like to make is that your description of Port Moresby as a “dump” is too drastic and unfair; I’d like to think that this is your view alone. There are thousands of my fellow Papua New Guineans who have to live in Port Moresby, despite its problems, because they want to pursue that very human goal: the pursuit of a better life and this includes better education, job opportunities and simply a betterment of their circumstances. My only suggestion is that if you’re coming to PNG it is to keep an open mind and to not forget that it is technically a third-world country so you can’t expect a fairly well-developed-western-styled structure of government and life etc. You did correctly pointed out that poverty does exist in PNG and I don’t think any Papuan New Guinean will dispute that. Having said that, I cannot ever remember going hungry when I was growing up and I am one of ten; in fact our diets were fairly healthy consisting of lots of vegetables and fish and a good lifestyle of lots of physical activity including daily swimming in totally unpolutted water – I’m from New Ireland so I guess there was better access to these good things! Also, aside from the 800-odd languages, there are thousands of cultures and a fervent respect and commitment to our various religious beliefs and one which I might add we have the absolute freedom to practice. To conclude, I’m glad you’ve had the chance to experience and learn a tiny aspect of PNG – there is so much more you could learn. Hope you visit again; if you like surfing you may like to consider travelling to Kavieng, New Ireland! Very interesting to read your account of PNG. I once worked with someone who had lived and worked there for a couple of years, and I have always wanted to visit. Interesting to hear that they are self-sufficient food-wise. If you have that, then the poverty is easier to bear. I’ve usually found that the root of the pidgin words I’ve encountered make sense when it is explained word for word. Isn’t it lonely traveling all by yourself? ?